Chokepoints are narrow channels along widely used global sea routes and are critical to global energy security. The inability of oil to transit a major chokepoint, even temporarily, can lead to substantial supply delays and higher shipping costs, resulting in higher world energy prices. 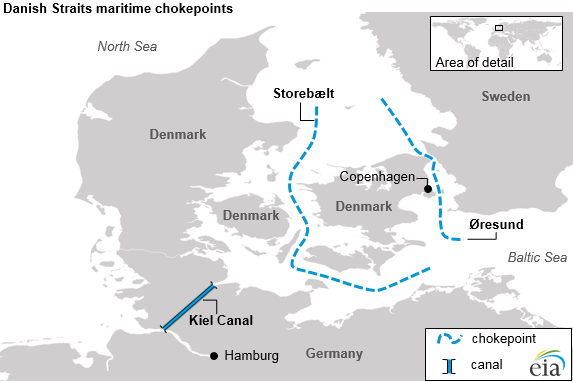 The Danish Straits, a series of channels that connect the Baltic Sea to the North Sea, are an important route for Russian seaborne oil exports to Europe. An estimated 3.2 million b/d of crude oil and petroleum products flowed through the Danish Straits in 2016. Russia shifted a significant portion of its crude oil exports to its Baltic ports after opening the port of Primorsk in the Gulf of Finland in 2005. A relatively small amount of oil, less than 50,000 b/d, primarily from Norway and the United Kingdom, flowed eastward through the Danish Straits to Scandinavian markets in 2016. The Turkish Straits, which include the Bosporus and Dardanelles waterways, divide Asia from Europe. The Bosporus is a 17-mile waterway that connects the Black Sea with the Sea of Marmara, and the Dardanelles is a 40-mile waterway that links the Sea of Marmara with the Aegean and Mediterranean Seas. Both waterways are located in Turkey and supply Western and Southern Europe with oil from Russia and the Caspian Sea region. Only half a mile wide at the narrowest point, the Turkish Straits are among the world’s most difficult waterways to navigate because of their sinuous geography. 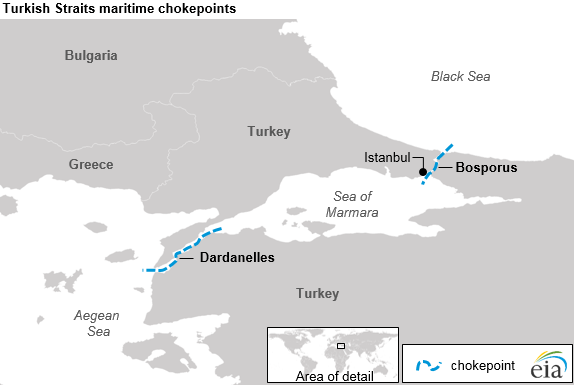 About 48,000 vessels transit the Turkish Straits each year, making this area one of the world’s busiest maritime chokepoints. Commercial shipping has the right of free passage through the Turkish Straits in peacetime, although Turkey claims the right to impose regulations for safety and environmental purposes. An estimated 2.4 million b/d of crude oil and petroleum products flowed through the Turkish Straits in 2016, more than 80% of which was crude oil. These Black Sea ports are among the primary oil export routes for Russia and other Eurasian countries, including Azerbaijan and Kazakhstan. At its peak in 2004, more than 3.4 million b/d transited the Turkish Straits, but volumes have fallen as Russia has shifted crude oil exports away from the Black Sea and toward the Baltic ports. Subsequent increases in production and exports from Azerbaijan and Kazakhstan resulted in an increase in shipments through the Turkish Straits, but those increases were short-lived. These volumes may increase in the future as Kazakhstan’s production of crude oil increases and the country exports more crude oil via the Black Sea. EIA expects Kazakhstan’s crude oil production to increase through at least the end of 2018 as volumes from the country’s Kashagan field continue to rise.